In the near future, I will have purged almost half of my closet. Why? I, along with almost everyone in the developed world, (1) have more than I need on a weekly basis, and (2) tend to make purchases that aren’t really relevant. Too often, I buy things that are great in theory, but aren’t appropriate for my actual habits. I love beautiful craft. I love a bargain. And perhaps most topically, I find pieces and am inspired by them, as if I could be a different person in them, but in practice they lay stationery, unworn. Many things convince us to buy, even when some part of our brains have doubt. The fear of regret of not buying when an item is available, if scarcity is an issue. The psychological pleasure we get from the act of acquisition. Peer pressure, too. A few months ago, I read a feature on Marie Kondo, who pioneers a mantra of not possessing anything that doesn’t spark joy. Generally, we all have too much stuff, and could feel more free by dispatching most of it. The turning point for me to decide to sell a truckload of stuff was three-fold. First, it was realizing that I have many options in my closet, but skip over some pieces in favor of a select few, outfit after outfit. For whatever reason, though I spent a small fortune on them, I never wear the two Rick Owens black t-shirts I own that are extra long (his signature aesthetic). Ideally, they are suited for taller, slimmer bodies, and so finding a way I feel comfortable and confident wearing them has been difficult with my body type and shape (shorter, ‘bulkier’, and curvier). So in nearly a year since purchase, I have worn them each maybe three times. Aesthetically, they are lovely and of the highest quality viscose (synthetic silk). From a practical perspective, I don’t reach for them because I don’t feel I know how to wear them (or am skeptical that they actually look good). Similarly, while in Stockholm, I spent time with my new friend Frederik, including a morning when I browsed his closet. We had many conversations about fashion and style, and his ideas inspired me. Why wear boring, anonymous things? For me, this would mean a tendency to stick to safe colors like gray and navy. According to him, Zara often makes more interesting things than even more expensive brands, which are forgettable and ultimately interchangeable. I’m not convinced that I need to stand out in every context, but wanting to be unique and memorable isn’t a bad thing to strive for. Certainly, walking away from a purchase is easier if it looks fine, but doesn’t touch a nerve somehow. And most recently, I tried on a pair of shoes at Prada. This is nothing new, but I have begun to evolve my thinking about footwear. Leather soles are more expensive and though to be more durable over the long run. But they are also hard-soled, and spending all day in them can be very exhausting for the feet. 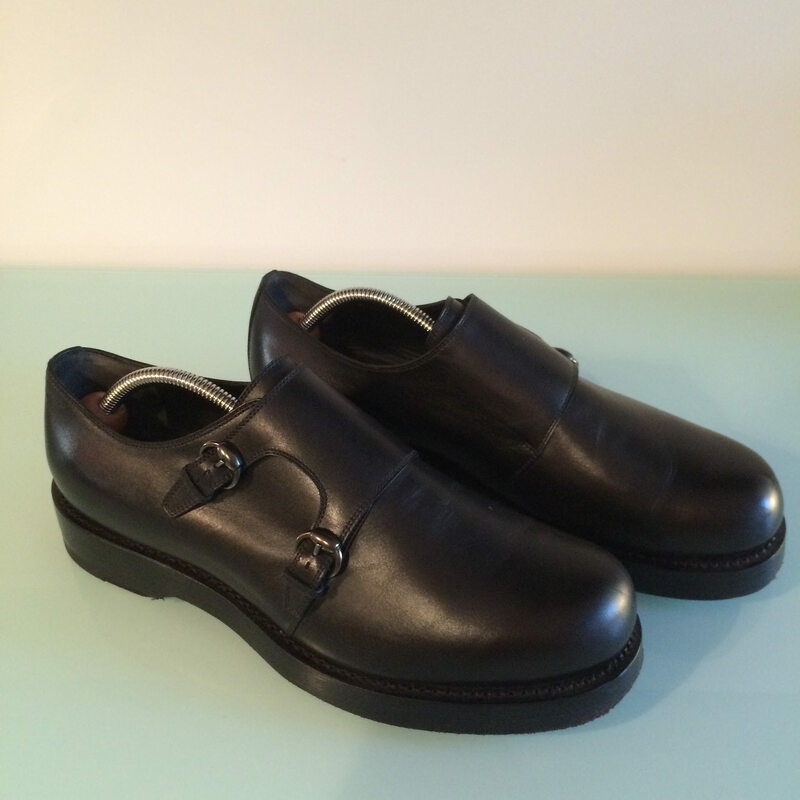 Rubber-soled shoes, conversely, are far more comfortable, but perhaps less elegant. With the help of Vestiaire Collective, an online second-hand boutique based in Paris, I have already sold some underused items like a Marni backpack, Gucci duffel bag, and Louis Vuitton sneakers. On the agenda for selling: two pairs of Prada lace-up shoes, two pairs of Bottega Veneta lace-up dress shoes, a pair of Gucci black suede derbies, a pair of Gucci monk-strap Goodyear-sole shoes, the two Rick Owens t-shirts, a Gucci brown dress belt, a Prada brown woven-leather belt, a Balenciaga black leather wrap bracelet (sold! ), an Arcteryx Veilance black wool track jacket, a Dior Homme sleeveless sweatshirt-vest, and a Yves Saint Laurent black t-shirt. For the less luxurious items I have from brands like COS, Paul Smith, Armani Jeans, and others, I will head to Bivio to sell the items and get store credit for future purchases at the store. It is here I find so many interesting, mind-expanding pieces which for a small price allow me a bit of experimentation. To make “mistakes” in purchasing comes at a cost. While it is good to be able to recover some of an item’s cost, buying and reselling rarely results in a profit. In a few cases, I have purchased and resold at nearly the same price, but mostly I lose some value in the process—the cost of wear, time, etc. Another reason to limit impulsivity. Hanging in the balance of all this buying and selling is a sense of tending to my closet, the way gardeners prune and arrange their plants. While my tastes have evolved, I am always trying to accumulate smarter, more efficiently, and be a more disciplined shopper. This means knowing myself well. White instead of a more standard color? More restraint goes against the constant tug of marketers and designers, enticing all of us to spend less mindfully and indulge more often. I have no steely resolve against this, but I have learned to (mostly) see past the experience and instead critically analyze what I am considering. The ultimate goal in a Marie Kondo world would be to have a closet with all pieces that fulfill a need, defined by years of dressing trial and error. I am not naïve enough to think this is so easily accomplished, but I can try to move closer to it. Agree with Frederik! Also, didn’t you ‘just’ get the ‘new’ pair of Bottega Veneta this past summer?